are descended from immigrants and revolutionists." I left a restaurant in the pouring rain, which can make looking for a cab rather daunting. Mercifully, an available cab appeared. I got in, and the cab driver immediately asked that I be patient with him; it was his first day on the job and he hadn't quite yet mastered Manhattan's streets. We began chatting as we navigated the twists and turns of the West Village. He was a recent immigrant from Pakistan. He'd intended to move to America as a student of Columbia University. However, he wasn't accepted because, he said, of a low SAT verbal score. But he did not want to go any place but Columbia. And he did not want to live any place but the United States. So he found a way to immigrate here. He would get a job and study English. As many from his country do in New York, he got a job as a cab driver. He also began reading Faulkner and is looking up every word he doesn't know. Just as he was bound and determined to get to America, he is bound and determined to win admission to Columbia. He is doing what he can to make it so. Such are the stories that can be heard in the United States, and are perhaps unique to the United States. It has, arguably, been a rough decade for our country. The new millennium began with a recession, followed by devastating attacks. Consequently, we have been mired in two wars, which have, to some degree, hurt our reputation, both abroad and at home (a fact that the media likes to give much attention to and, perhaps, exaggerate). We are in the fourth year of a terrible recession, and there aren't many signs it will be ending any time soon. It's easy to get distracted by our country's very big and very real issues. So easy that we can forget that people still risk and sacrifice everything to immigrate to America. People all over the world, even in regions where many feel conflicted about America, still believe America is the great hope, the only path to a better life. America continues to lead in naturalizing citizens. A report shows, not surprisingly, that job opportunities continue to drive immigration, far more so than immigration policy. Since 9/11, immigrating to the U.S. has become more complicated, yet we still lead in immigration. Sweden, on the other hand, introduced relatively lax immigration policy, with no real change. 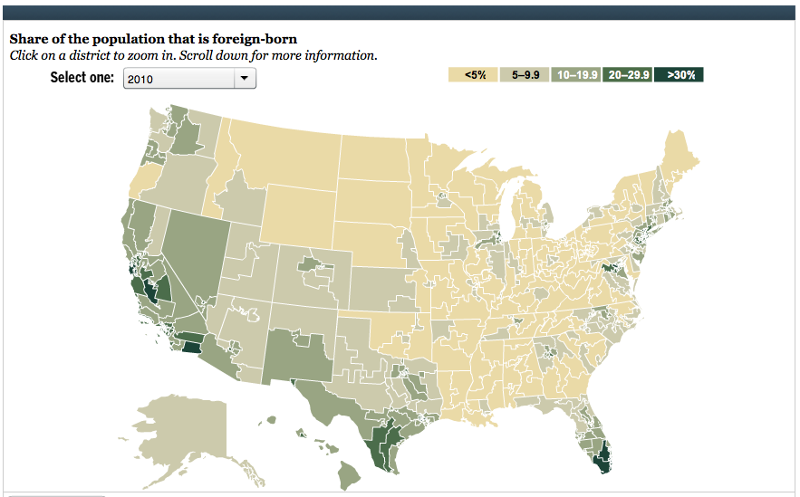 Per 2010 Census data, 13% of U.S. residents, or 40 million, are foreign-born, including naturalized citizens and non-citizens. The Census does not include illegal immigrants in this count, but the Pew Hispanic Center estimates that number at 11.2 million. America is undoubtedly still perceived as the number one country for opportunity, employment and a path to a better life. On the heels of celebrating our 236th year of independence, this issue of TLV will celebrate the spirit of America that still draws millions in every year - the idea that here, anything is possible. We will take a look at immigration now and then, examples of incredible achievements of immigrants, and the state of immigration today. Immigrants always have and still do enrich our country in countless ways. They remind us of what complacency allows so many of us to take for granted - that our freedom truly is remarkable and something about which to feel enormous gratitude and pride. And they remind us that we Americans are, ultimately, all immigrants. Thank goodness we are in the summer months, when life gets filled with distractions. Virtually everyone takes a vacation of some kind, at some point. With people scattered about and focused on their own plans and agendas, drama is harder to perpetuate. Maybe this is why the "October surprise" exists. There isn't enough collective momentum during the summer months. But then September rolls around, everyone is back to business as usual, and major trends regain their momentum. A few weeks later it's, "Oops...what happened here?" Spain's cost of capital has risen again above 7%. The market doesn't seem that happy, but it also hasn't panicked. We seem to be skating through summer, with a bit of ho-hum over the significant challenges in Europe and the economic slow downs in China and the U.S. "Don't worry," I guess is what we think, "things will either be better or the same at summer's end. Or if not, then we might as well enjoy the summer." For now, headlines will whiz by, but for many they won't take hold. Many won't feel compelled to do much about them. Very little drama will surround otherwise newsworthy events. It's like we all develop a bit of the "mañana syndrome." Be that as it may, our very real economic issues persist, and we face a very consequential election in the fall. This October seems particularly ripe for some sort of "surprise" and a lot of drama. Or maybe we're just waiting for that magic Mayan date of 12-21-12! I am writing this little essay from London. How keen is that, working my day job from across the Atlantic. Technology and communications have made it easy for many to travel where they want, and in many cases live where they want and still be productive with their job responsibilities. It's a grand new information age...for some. For others, though, the information age has destroyed jobs and careers. If one's skill is generic enough to be exported to a cheaper labor market, then bye-bye career path as we knew it. This is the dysfunction that exists in today's job market. In particular, it is destroying middle class jobs because they are the most easily exported. Or, in an even more ominous trend, being replaced by automation. The job market today is significantly challenged. Consider what unemployment might be if the government wasn't spending $1T a year more than it is taking in. Consider what unemployment might be if the Federal Reserve hadn't been printing money to keep interest rates at historic lows. How much of our housing market is supported by thirty-year mortgages below 4%? And loans for companies are at a modern day low. 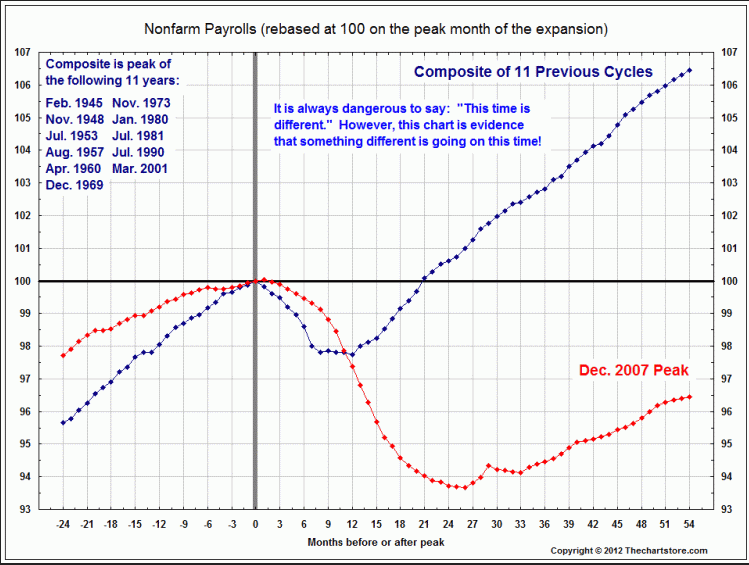 Where would employment be if interest rates were at historical averages rather than historical lows? It's time we all started getting a bit more realistic about our jobs, our opportunities, our compensation, our careers and the way we lead our families. No matter the current unemployment numbers, they would be far greater without the enormous support of government. The recent splendor in the grass age is behind us, at least for some time. It's time to get back to realistic expectations and good old hard work that may reward us over the course of a career rather than just a few short years of effort. It's so hard to think for ourselves. Joining a club is much easier. These days, we love to blame Washington for all that ails us, but we seem to forget that it's the voters that put these people into power. Our current dysfunctional political environment is nothing more than an extension of the inability of voters to seek an understanding of our circumstances. What we may be staring at today isn't so much dysfunctional politicians and government as it is dysfunctional voters. We are the problem. Why might this be so? The likely culprit is something that's been mentioned several times in this column...We are victims of too much information. With too much information to sort through, we seem to have turned politics into sport. It is just easier to become a fan of this person or that, this ideology or that, than it is to think critically and analytically, do the research, be introspective, and engage in productive, thoughtful debate. Politics has turned fanatical. If we are a Texas Longhorn, then we hate Aggies. If we're an Aggie, we hate Longhorns. There seems little difference today between conservatives and liberals and the way we join and follow sports teams. Instead of seeking worthwhile perspectives and answers to challenging questions, we have fallen into the trap of being joiners for the sake of feeling like we belong. With too much information and too many "experts" reaching entirely different conclusions and spouting off entirely different talking points, we have become little more than mice behind different pied pipers. Getting us to change our thinking, to change our perspectives is often too difficult. It would require us leaving the club, leaving the security of belonging to something. What would our family, friends and co-workers think if we switched political parties? How might it affect our careers? This is the stalemate of modern politics: Government has become dysfunctional, but we voters appear afraid to dig deep for answers beyond the slogans and rhetoric of fans. If the voters do not change, how can government change? How can we improve on thinking for ourselves? It's not so easy. When immersed in institutional thought, it can be hard to break free. Access to employer-provided benefits was greater in medium and large private industry establishments than in small establishments in March 2012. Access, or availability of a benefit, was 57% for medical care benefits in small establishments (those with fewer than 100 employees), compared with 89% in large establishments (those with 500 employees or more). In private industry, retirement benefits were available to 50% of workers in small establishments, 79% of workers in medium size establishments (those employing between 100 and 499 workers), and 86% of workers in large establishments. Job Openings and Labor Turnover Summary: There were 3.6 million job openings on the last business day of May, little changed from 3.4 million in April. The hires rate (3.3%) and separations rate (3.3%) were essentially unchanged in May. U.S. import prices fell 2.7% in June. Lower prices for both fuel and nonfuel imports contributed to the overall decline. U.S. export prices fell 1.7% in June after a 0.4% drop the previous month. 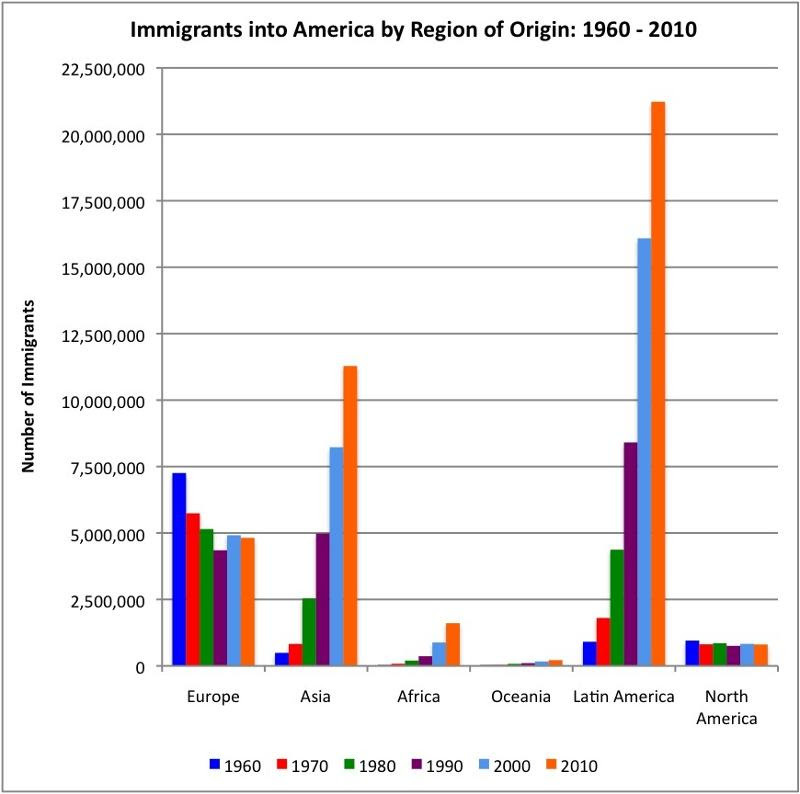 Please follow this link to download the data used to build this chart, which include a by-country immigration breakdown. In 1989, Charles Guggenheim directed and Gene Hackman narrated this award-winning documentary about Ellis Island's busiest years. From 1892 to 1954, over 12 million immigrants became Americans through the portal of Ellis Island. It's a moving film that illustrates the enormous risks millions took to seek freedom and hope. People left families, left oppressive countries, endured dangerous trips, often alone and with no more than what they could carry. Actual Ellis Island immigrants share their experiences leaving their homelands, journeying to America, and the awe they felt when they first laid eyes on America. Peggy Noonan shares three inspiring immigrant stories that remind us that our freedom is incredibly special and uncommon. Immigrants can come here and find a sense of community and acceptance that often was or is not available to them in their native lands. They can also come here and find friendships with people they were taught to hate. They can be open to what America offers, work hard, and even rise to the level of Secretary of State. 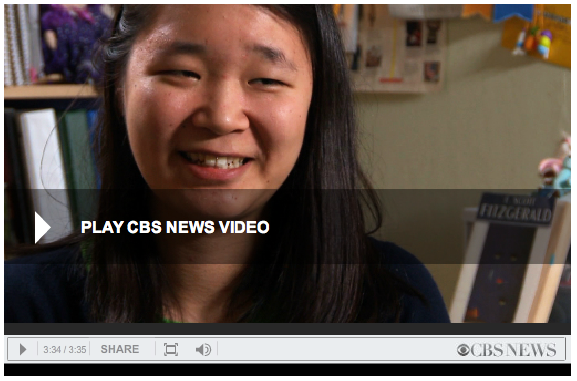 These stories remind us that in America, anything is possible and your experience is what you make it. In 1992, Albanian Gac Filipaj fled his war-torn home of Yugoslavia. He was soon to be drafted into the Yugoslav army by the Serbs, considered the enemy of Albanians. He chose instead to leave his family and find a better life in America. When Filipaj arrived in NYC, he asked which were the best schools. With Columbia topping his list, he went there to look for work. He spent decades there as a janitor, all the while making many sacrifices so that he could send money back to his family, milk farmers in Yugoslavia. Once his English improved, he gained admission to Columbia. For years, he'd attend classes during the day, do a 2:30pm to 11pm janitorial shift, and then pull all nighters to complete his homework. Hard work paid off, and he was awarded a bachelor's degree in classics with honors this past May. He's now considering a master's or PhD and one day hopes to be a teacher. Perceptions about immigration have enjoyed a significant uptick in the past year. According to recent Gallup data, 66% of Americans view immigration as "a good thing," up from 59% a year ago, and just a point below its 67% peak in 2006. Follow the link for more results from the immigration survey. Per Gallup data, 630 million adults in the world would like to move to another country. Forty-eight million are planning to move within the year. The Middle East and North Africa have the highest percentage of natives planning migration, followed by Sub-Saharan Africa. 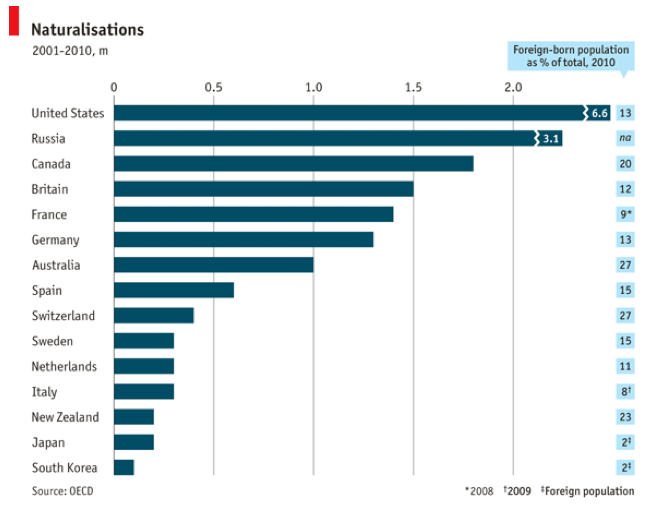 Statistically, it is the most educated and employed (to some capacity) that seek to migrate to another country. This fascinating chart looks at the global economy since year 1 AD. Tony Schwartz of The Energy Project recently spoke to 160 executives from a large bank where he asked attendees to fill out a survey called "The Energy Audit." Seventy-seven percent reported they struggle to focus and felt easily distracted throughout the day. Eighty percent said they felt they had too little time to think creatively and strategically about the long-term because they are distracted reacting to short-term demands. Schwartz explains that this data has increasingly become the norm, where employees feel depleted by increasing demands on the job, exacerbated by technology and the expectation that we be responsive 24/7. Schwartz breaks down more data that paint a picture of overly taxed and exhausted employees. He stresses the importance of CEOs fostering an environment where people are encouraged to take care of themselves. How we spend our time outside of the office, Schwartz argues, has a direct impact on how we spend our time in the office. He suggests activities that energize, including sleep, exercise, time with loved ones, and avoiding work emails after work hours. Paul Zak, author of The Moral Molecule, has spent a decade studying oxytocin and its effect on human interaction. In particular, he has found that trust releases oxytocin, which makes people feel empathy. It's a powerful hormone that Zak has found can have a profound impact on productivity and happiness. In terms of management and leadership, Zak believes styles that trigger an oxytocin response in teams are far more effective than fear-based tactics. 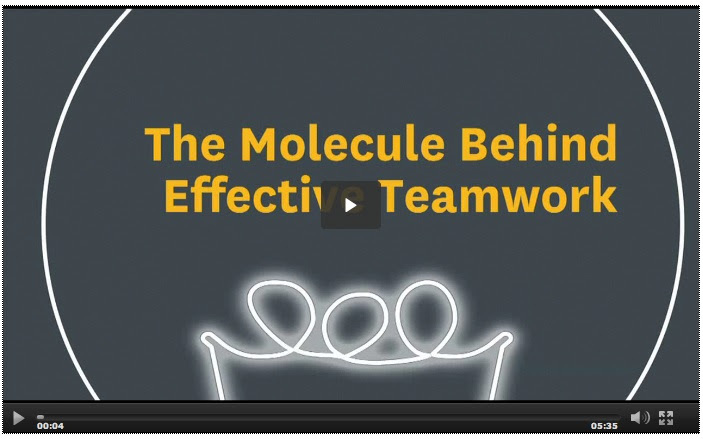 Watch the video for his take on power of oxytocin-releasing strategy in the work place. If trust releases oxytocin, and oxytocin improves relationships, empathy and happiness, then building trust seems integral to successful management and a successful company. Here are five tips for building trust with your employees and coworkers. In a recent report, PayScale recorded the most positive wage data since the recession began. Q2 2012 saw a 2.3% year-over-year earnings uptick, with growth that looks similar to pre-recession growth. Business Insider looks at the state data and reveals that Houston has shown the strongest earnings growth in the past year. Dallas comes in at number five.